On June 17, 1922, Church Cricket Club spent 1s 10d on a telegram which brought about a reunion with a player last professionally engaged at the Club 17 years earlier. Up to the weekend of June 21, Church had to rely upon substitute professionals whilst awaiting the arrival of Frank O'Keeffe, and Sydney Barnes wase engaged to play in the big match against Nelson whose pro was the redoubtable Australian, Ted MacDonald. At the outset, Barnes came to Church in 1904 at an age, by cricketing standards, marginally on the wrong side of his prime. He was born on April 19, 1873, and was in his early 30s during his spell with Church in 1904 and 1905. He was now 49 but by his own standards, however, was still in full flight. In fact, later in 1929, at 56, was fifth in the first class bowling averages. He made his return to Church for the Nelson game, and was paid �25 for that afternoon's services - a princely sum at the time. The great Ted MacDonald blasted out Church for 58, but Barnes' spiteful reply was 6-19 and the powerful Nelson were routed for 44. Barnes had started his county cricket career before the start of the Boer War and he finsihed as a professional with Bridgnorth, Staffordshire, in 1938, aged 65. In that year, he played on every day except Friday of the August 'week', and ended the season at the top of the club's batting and bowling averages with 126 wickets at 6.94 and 314 runs at 28.55. His first class match debut was for Warwickshire in 1895, and his last was for Wales in 1930 at the age of 57. Yet in the whole of that 35 year span, he played only two full seasons and six assorted games in the County Championship - a total of 44 matches. Surprisingly enough, he made more appearances than that for English touring sides in Australia and South Africa, including 27 Tests. His last cricket match of all was for Stone in the Wartime Staffordshire League in 1940, and at 67, he took 6-32 and 4-12 against Great Chell, 5-43 against Leek, and 5-22 against Caverswall. This was undoubtedly the greatest bowler ever to appear for Church Cricket Club. After his first class career had finished, he was engaged for three consecutive seasons (1931-3) by Rawtenstall, when at the ripe old age of 58+, he took 115 wickets in 1931 (average 6.22) and 109 wickets in 1932 (average 7.36). 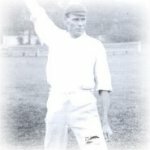 In 1933, he was injured for a period, bowled a mere 275 overs, taking only 54 wickets at 13.72 (including 9-55 against Ramsbottom at the age of 60). Barnes was over 6 feet tall and presented a somewhat awe-inspiring presence even in great age. He died at the age of 94 on December 26, 1967. He was a fast medium right hand bowler who also bowled finger spin. His deliveries bounced and hit the bat, seaming one way and the next, making him a sort of medium pace spinner. He also moved the ball both ways in the air by virtue of his spin rather than any intent to swing. He was a thinking cricketer and plied his trade with irresistible hostility and stamina. He first came into the Lancashire League with Rishton for the seasons 1895-99, following this with two seasons with Burnley in 1900-01. At that point, he had taken only seven wickets in County matches, but in the last match of the 1901 season, he was selected by A C MacLaren to play for Lancashire against Leicestershire at Old Trafford. In the second innings, he took 6-70 whereupon MacLaren announced that his new find would go with his side to Australia. Although he broke down after the second Test, Barnes had established himself with figures of 5-65, 1-74, 6-42 and 7-121. He continued to play for England spasmodically until 1914. He ahd played for Church in 1904 at a wage of �6 a week plus a job at William Blythe Ltd, which he thought fair enough. However, when he took 49 wickets in the first four Tests in South Africa in 1913/14, he obviously decided that the financial rewards there were not fair enough and, following a disagreement, declined to play in the fifth Test. After that, he concentrated his talents in what became his killing ground, the Leagues of the NOrth of England. In his life within those Leagues, he took well over 4,000 wickets at a cost of about 7 runs each, and scored 17,000 runs at an average of 25. As late as 1929, at 56, he took 8-41 for the Minor Counties against South Africa, and 6-28 for Wales against the same team. He once took five wickets in five balls in a League match, took four in four balls on four occasions, had innumerable hat tricks, and took all ten wickets at least a dozen times in his career. In all cricket, it is estimated that he took over 6,300 wickets at an average of about 9 runs apiece. At Church, in 1904, he established a new professional aggregate record for the club with 666 runs at 31.7, and participated in waht is still the record stand for the club - 209 runs for the second wicket - Barnes 113 not out and Duckworth 74 not out. He took 64 wickets at 10.12, overshadowed somewhat by Thomas Flowers who took 72 wickets at 9.51, establishing a new amateur record. In the following season, Barnes had 82 wickets at 9.34 but scored only 264 runs at 16.5. Church finished in third place. He was hard on those who played alongside him, and he was hard on himself. At 90, he was described as possessing 'essential strength and co-ordination reflected in an impeccable copper-plate handwriting and in his unhurried but unwavering movements at an age when most men are at least somewhat shaky.' Frank O'Keeffe was the big signing from Australia who took over for the rest of the 1922 season, but it is likely that the abiding memory of those ten amateurs was of the chance to walk out onto the West End Cricket Ground in the company of Sydney Francis Barnes, and of 1s 10d for a cable to Sydney - money well spent!